Google · Microsoft · News · Social Media · Whats Hot! 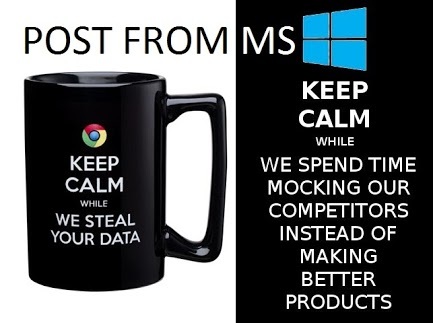 Just the day after Microsoft took its anti Google campaign to new heights by putting Scroogled coffee mugs, T-shirts, Caps and Hoodies for sell on its online store Google responded with a sarcastic wit. The statement hints that while Google is working on its most talked about head computer ‘Google Glass’ and upcoming smart watch Microsoft has gone down to make T-shirts and Hoodies. One reason that we haven’t seen a Scroogled merchandise mocking Google Glass is probably the fact that Microsoft is also secretly working on one such device. 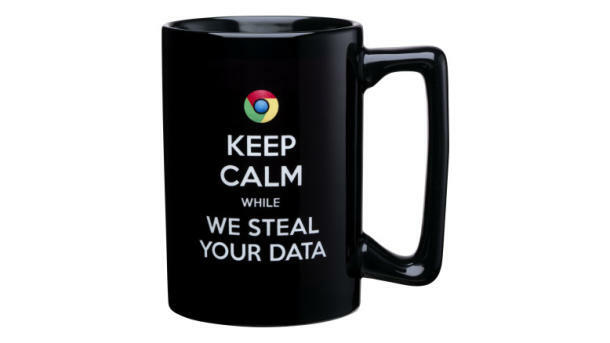 The most popular merchandise in the list is the coffee mug that says ‘keep calm while we steal your data’ with a chrome logo on it. The saying is Microsoft’s take on the popular worldwar II’s popular British government poster “Keep Calm and Carry On”. Another hot pick is the T-shirt that has Chrome browser in detective uniforms and reads “I am watching you”. Google’s social site Google + is bombarded with fans response to Microsoft’s Scroogled merchandise. The #Microsoft #Google and #Scroogled has become popular on the social site with dozens users making fun of Microsoft’s search engine Bing, email service outlook and video chat Skype. Some Google fans also designed anti Microsoft graphics to mock the software major’s poor performing web browser and search engine. Microsoft started the Scroogled campaign last year that talks about Google’s policy to use internal data for displaying advertisement. By launching the anti Google promotion the company asked users to switch to its email service Outlook and search engine Bing.